We have a close family friend in her late 80s who fled Germany to American pre-World War II, and is so loyal to her country of refuge that she’ll speak no ill of it. She adheres to its laws and customs fully, with enthusiasm and rigidity. She wouldn't dream of speeding, is appalled by the very thought that people might cheat on their income taxes, thinks insulting the president of any party is beneath contempt, and is aghast that people would consider buying foreign cars. When it comes to her medications, though? These, in a completely uncharacteristic move, she orders from Canada, and thus becomes a law-breaking granny, despite her patriotism. She is far from alone. It is estimated that Americans, many surely less loyal to their land than our friend, purchase more than $1 billion in medications a year from Canadian pharmacies. And while it seems like 'everybody's doing it,' importing these drugs still remains illegal--and there are fairly stiff fines on the books. The Federal Food, Drug & Cosmetic Act prohibits the importation of prescription drugs--and that doesn't just include controlled substances. Technically section 804 of that Act allows importing foreign prescription drugs if a number of conditions are met, but as you read through these, try to imagine how many people really can check off each requirement. The drug must come from a licensed pharmacy. The drug must be for personal use only. You may purchase no more than a 90-day supply of medication. The drug may not be resold. The drug must be FDA-approved. The drug manufacturer must be registered under Section 510 of the Act. You also ought to know that even if your package isn't checked, you must declare your medications to customs. It is illegal (although quite common) not to do so. Additionally, be aware that possessing certain medications without a valid prescription violates laws at all levels--federal, state and local, and is thus punishable by both prison time and fines. Now let's just theorize that, say, a person hasn't met every single condition (how many Canadian pharmacies are honestly registered with the FDA? Not too many, I can assure you). Importing drugs (and that's just non-narcotic ones) is punishable by up to 5 years in prison and a $250,000 fine. Importing narcotic drugs is punishable by higher fines and more prison time. In reality? The vast majority of the time, nothing happens at all. If your package is suspicious, customs sets it aside and contacts the FDA to decide whether to permanently detain the drugs. If your drugs are detained, the FDA must send you a letter asking whether you can show that your medications meet legal requirements [you'll need a copy of your prescription, and the drugs in your package must be stored in their original containers]. If you cannot, the medications can be destroyed or returned. It’s not really all that threatening. The reason for over a million Americans taking their chances with the law and crossing the border or ordering online to get medications from Canada isn't hard to fathom. As James Carville might have said, if asked, "It's about the money (stupid)." In 2007, brand-name drugs were an average of 53% lower than in the United States — compared to 51% lower in 2006 and 43% lower in 2003. The price differences are significant and irrefutable. There are a number of reasons why drugs are cheaper in Canada than in the U.S., ranging from price-capping to encouraging price competition to standard of living to advertising to American litigiousness. Thus it is very tempting for Americans to buy their drugs across the border, and around 2000 it became much easier, when Canadian Internet pharmacies made their appearances. The FDA was not amused. They asserted that there was a serious risk of potential side effects to medication bought this way, no recourse if side effects did occur, and that, even if Canadian doctors wrote the scripts, in order to technically comply with the law, that effort was little more than a sham. "A number of Canadian drug websites and ordering services indicate that the Canadian drugs are dispensed pursuant to existing prescriptions that are rewritten by a Canadian doctor in order to comply with Canadian law. However, dispensing medication based on a prescription written by a physician who has not seen the patient or conducted a physical exam is contrary to medical practice standards." Sites can easily invent themselves and disappear in a matter of days, and there is no recourse you--or the U.S. government—has if you are cheated. The FDA continues to maintain, however, that it cannot ensure the safety of Canadian drugs, whether ordered online or smuggled across the border. As far back as 2003, the FDA gave testimony published as "Safety of Prescription Drugs From Foreign Sources." It was quite clear that it could not guarantee the safety of drugs from foreign sources, stating, "FDA cannot assure the American public that drugs imported from foreign countries are the same as products approved by FDA. Consumers who buy prescription drugs from foreign countries are at risk of suffering adverse events, some of which can be life threatening. These risks include potential side effects from inappropriately prescribed medications, dangerous drug interactions or side effects due to drug contamination. Patients are also at risk because there is no certainty about what they are getting when they purchase some of these drugs." 2005 brought more calls for alarm from the FDA. The FDA conducted a covert operation, named “Operation Bait and Switch,” over a few days in August 2005 and found that almost half of the imported drugs intercepted by the FDA were supposedly placed with Canadian pharmacies. However, 85% really came from 27 other countries. Dr. Andrew von Eschenbach, Acting FDA Commissioner, said, "These results make clear there are Internet sites that claim to be ‘Canadian’ that, in fact, are peddling drugs of dubious origin, safety, and efficacy." In March 2007, the FDA commissioner was Dr. Mark McClellan. He said then of Canadian drug safety, "Because we don't have the authority to tell where these drugs have come from, or to monitor closely how they're getting into the United States, and to make sure that the drugs that come in are safe, it could be a widespread problem." However, others are not convinced that there is a safety problem. Dr. Marcia Angell, former executive editor of The New England Journal of Medicine and a well-known drug company critic, responded, ""That's a lot of hooey. There is no reason that buying drugs in Canada is any less safe than buying them in the United States." Simply, the FDA does not have authority to regulate drugs sold in Canada. They worry that the drugs might be coming from some other country, and merely passing through Canada, or that they could be "counterfeit, contaminated, or subpotent, among other things." Although Canadian online pharmacies have recently garnered high safety marks, it remains impossible for the FDA to know for certain that you're getting what you believe. FDA spokeswoman Sandy Walsh clarifies that "[t]here are . . . bogus Canadian sites that aren't from Canada but originate in other countries. We've done some studies that show some of these drugs are expired, counterfeit drugs, or do not contain any or enough of the active ingredient it claims to have." In short, she reminds Americans, "Purchasing drugs online from other countries is illegal." cause you to receive drugs that are slightly different than what you are used to taking. Medicine from other countries may have variations and differences that can cause new side effects or interact with your other medications. put your personal and financial information at risk. The FDA suggests that the pharmacies don't have the ability to protect your information--and some might even purposely misuse it, selling your information to Internet scams. However, the Canadian pharmacies believe you are safe in their hands. Tim Smith, general manager of the Canadian International Pharmacy Association, the major organization that supervises Canadian pharmacies, statedclearly to the American media that ordering prescription medication from a Canadian online pharmacy is perfectly safe—and he wants them to get out the message. He has significant research to back up his claims. A report, “Unveiling,” by the U.S.-based national Bureau of Economic Research, found that drugs sold by online pharmacies accredited by the Canadian International Pharmacy Association were completely authentic--and charged 52.5% less for the same 5 top-selling brand-name prescription meds. Researchers concluded that these findings “. . . suggest that a blanket warning against any foreign website may deny consumers substantial price savings from verified . . .websites." Let's say you've weighed the pros and cons, and decided that you're going to buy from an online Canadian pharmacy--and save yourself some significant cash in the process. At the outset, keep a few things in mind. Any valid pharmacy requires a prescription, period. If it doesn’t ask for one, it’s not the real thing. If you pay your money and never see your product, you will have no recourse. Be prepared. A valid Canadian online pharmacy will never sell a controlled substance--even with a prescription. 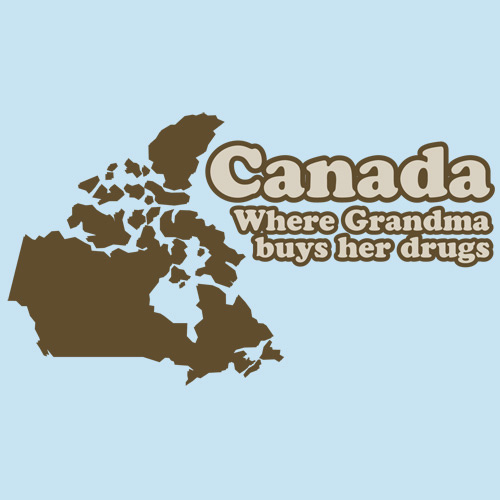 Make sure you're dealing with a legitimate online Canadian Pharmacy. The site PharmacyChecker.com, founded by a Canadian doctor, lists online pharmacies that have been proven to be legitimate, plus those that are frauds. Additionally, the Canadian International Pharmacy Association lists websites that are not to be trusted, and updates regularly. If the site offers to issue you a prescription based on your responses to an online questionnaire, it is phony and operating illegally. Don't buy from it. Make sure your site provides an actual physical address that you can contact in case you need assistance or something goes wrong with your order. If the online pharmacy offers discounts or prices that seem too good to be true, they probably are, and if it sends you spam or unsolicited e-mail offering cheap drugs, it's a good sign it's not a kosher operation. Don't order drugs that are not approved by the FDA. It's illegal to import such drugs into the U.S., and there is nothing to guarantee your safety if you take them. Know that if you are swindled, you have no recourse to recovering your money. However you should report the site to the FDA, as the Agency has some power to request fake pharmacies to cease operations. Be ever-vigilant for counterfeit products. For example, examine labels for misprints or misspellings. If your medicine tastes or looks different from what you are used to, stop taking it and have it examined. Finally, a Drug Identification Number (DIN), a computer-generated eight digit number assigned by Health Canada to a drug product before it's marketed in Canada, identifies all medications sold in Canada and is found on the label of every prescription and over-the-counter drug authorized for sale. A DIN indicates the manufacturer, product name, active ingredients and their strengths, drug form, and how the drug is administered. Selling medication in Canada without a DIN is illegal, so if your medication originates in Canada, be sure you can find one. Remember that the FDA does not have jurisdiction over the medication you receive, so you are always taking some risk that your medicine could be counterfeit or not contain all the active ingredients. But know that if you decide to take the risks and order your medications from Canada against the FDA’s advice. . .well, you’re in good company.